Which 39 cities have their own top level domain? This post will give you an overview of which cities have their own top level domain, and when you should use city domain extensions for your website. By now most people know that a lot of new domain extensions have come out over the last years. You might have heard about .xyz, .club or .guru. Heck, you might even have met a .london or .berlin on your way. But fewer are aware that more than 30 cities have their own domain names, and at some time in 2016 we will have 39 different city domain extensions. City domains have turned out to be extremely popular as an alternative to the classic domain extensions such as .com or the country code extensions (.fr, .de, .co.uk...). So popular that three of them can be found in the top 20 of most popular new top level domains since 2013 (more than 500 new extensions have gone live). Many startups and existing businesses have already adopted them as their official web address, and the first year annual renewal rate has been high. E.g. the .london domain extension experienced a first year renewal rate of 75,4% for the first 40.000 domain names. For comparison the annual .com renewal rate is below 50%. Before I explain when it makes sense to use the city domain extensions, let me just clarify what the new domain extensions can do for your business. This is the era of "Meaningful Domains"
We have entered what I call the era of "Meaningful Domains". The new breed of top level domains seen the last two years have allowed us to rethink what a domain name is.Today the domain name has the potential to be an important piece of your business' branding puzzle. This wasn't the original plan in 1985. At that time a web adress was simply more memorable than an IP address. That's why we accepted the usage of nonsensical domains. No one ever questioned the WHY of such strange extensions as .net or .biz. They served as alternatives for all the ones who missed out on the preferred nonsensical extension .com. "Everyone trusts a .com". Trust and .com? Try to check your spam folder and see how many .com emails and sites it contains. How can we trust an extension, which everyone is allowed to register and at a very low price? You can only trust very few domain extensions, which are restricted and has a high price tag. An example of an extension you can trust is the new .bank extension, which is restricted to banks only (and let me tell you those requirements are tough). When you land on a .bank website, you're at a safe place. 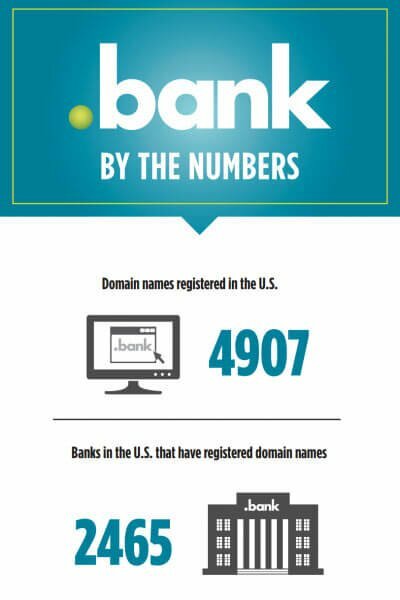 Until now 36% of banks in the US have registered a .bank, and the first banks already use them. A recent example is dollar.bank. "All the big brands use .com". Yes, all the big brands use a .com, but does it mean that you have to copy their behaviour? Most of these companies have existed for many years, when .com was the only option. While many will stick to .com, some of the big players are actually moving to a Dot Brand over the next years. E.g. 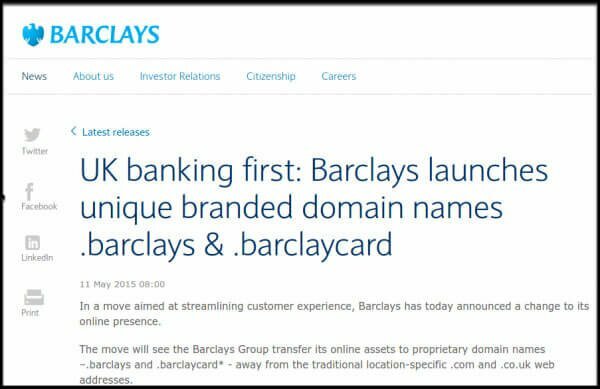 Barclays Bank (#404 on Forbes list of the world's biggest companies) skipped .com for .barclays recently. For a big global player a .com definitely makes sense, since they need a nonsensical extension, when no other simple word clearly defines what they do. But if you're a startup or a SME you most likely focus on a particular niche in a specific geographic area. So don't compare your business with world dominating brands. You need to stand out in your niche, and that is what meaningful domains are able to help you with. Are you ready to know when a city domain extension could turn into a valuable asset for you? A city web address is a meaningful domain name. The right side of the dot will assist to tell your story and connect with your audience. 1) It can tell where your business is located This will help you communicate that there is a real office with real people behind your website. It builds instant trust. 2) It can explain that you serve local clients It will make it easier for potential clients to identify you as physically located in the given city, when they look for a local service. 3) It signals that you are affiliated with the city This doesn't have to be a physical affiliation. Think Paris and you will automatically think fashion. Your products could be made in China, your business located in Bremen, but your brand perception is closer to .paris. 4) It can serve as an elegant, natural "domain hack" With city domain extensions you can have a natural looking domain hack. The left and the right side of the dot work together. If your brand is not known, but you're an accountant in London, you should use accounting.london as a way to build up an authoritative profile. If your city is part of the brand name, you could hack this as well. While one of the most recognized agencies in the world Mother uses motherlondon.com as their UK web address, they could show how cutting edge they are with mother.london instead. This leads me to the next point. 5) It can support the story that you're "cutting edge" Do a Google search for your service to see how many of your competitors don't use a .com. Today it's very few. Here's a great way to stand out and signal that you think ahead and are not afraid to be different. Creative sectors in particular can have an easy win here: Some examples are agencies, designers, architects and other creative minds. 6) It can help you rank better locally in Google Google officially treats all top level domains alike. Ranking high in Google is mostly about having relevant content and backlinks. But that's not all. "We believe that there is more trust from people when they see shorter name and one word. They are more likely to link to you, to cover you in a blog, to send you traffic. When people don't trust your site, they don't share it. With our .nyc domain, there is no need for branding. It resonates strongly, and it’s easy to remember shorter domains." Google is definitely not against the new domain extensions. They have invested significantly in these new options. They didn't hesitate to throw USD 25M on the table to become the registry for .app. 7) It can boost your pay per click effort such as Google Adwords While Google Webmaster Tools doesn't have the option to choose a city as your geo target, it's possible to do it for Adwords campaigns. The use of a city domain extension can really come to its right. If you only want your ads to be shown at city level you can for instance pick London as your geo target. The success of a Google ad depends on how it can reflect searcher intent. Since you have limited space the URL is therefore super important. .london supports a local search far better than .net or .co.uk would. Especially on mobile you have so little space to do with that a city domain extension is a big win. Check the screenshot below.Bill Hartzer and his team at Globe Runner has written a great case study testing this argument and proved that a new domain extension outperforms .com in Google Adwords. Let me end this post with some real life examples for further inspiration. Example 1: Friedrichstadt-Palast Berlin palast-berlin.eu -> palast.berlin Friedrichstadt-Palast Berlin boasts the world's biggest theatre stage and attracts nearly 700,000 visitors annually with its Grand Shows, children's shows and guest appearances, as well as the Berlinale, and galas. But its URL www.palast-berlin.eu was less than perfect for itscommunication with Berlin visitors worldwide. Thus, the decision to switch to the new address. www.palast.berlin was easy: "The rebranding is a virtual declaration of love to Berlin. Concise, easy to remember and with a clear reference to this internationally highly attractive travel destination," says Director Dr. Berndt Schmidt. Example 2: Half Hitch Gin halfhitch.co.uk -> halfhitch.london As London as you can be. Half Hitch Gin is not only manufactured in London, but it's also where the main store is located and founder Mark Holdsworth is a native Londoner. He says: "I was one of the first to get a .london. I am born and bred and did not want to miss it for the world". Example 3: Restaurant To Beef or not To Beef tobeefornottobeef.de -> tobeefornottobeef.berlin To Beef or not to Beef in the Schoenberg district of Berlin is all about Italian meat. Regional classics such as Bistecca alla Fiorentina, which has matured for at least 20 days. The meat is sourced directly from Dario Cecchini, the most famous butcher in Tuscany. Since this classy place is a favorite of the neighboring dotBERLIN crew, owner Giacomo Mannucci was quick to update the restaurant's website to tobeefornottobeef.berlin.